Privileged access management (PAM) helps you maintain control and visibility over your organization’s most critical systems and data. It includes numerous tools and features that can help deter and prevent data breaches caused by both malicious insiders or external cybercriminals. Using a PAM solution helps you maintain control and visibility over your organization’s most critical resources. Together, these modules support your security teams in their efforts to protect your organization from data breaches or other cyber-attacks. 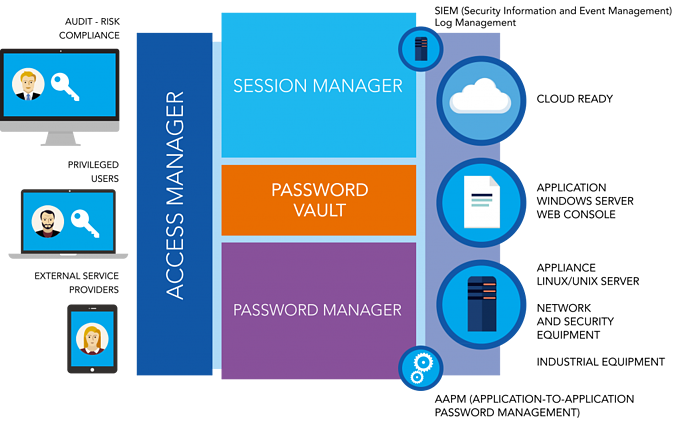 The Access Manager supports security teams in effectively managing all employee access from a single portal. It works with the other PAM modules to ensure that information is only accessible to certain users. It helps you ensure regulatory compliance and provides your security teams with an unalterable audit trail that can be utilized in proving regulatory compliance. Easily manage all privileged user access from a single portal. Customizable and centralized admin portal: Tailor the PAM Access Manager to your organization’s unique needs. Classify files according to company protocol and easily search across Bastions during breach or suspicious activity investigations from a centralized interface. Scalable multi-tenant architecture: As your organization changes, your security solutions should be able to change with it. The Access Manager makes it possible for security teams to create Bastion clusters and to give other users both common and unique access rights. Reduced attack surface area: The Access Manager uses a single https entry point for all access and sessions. With only a single entry point, the attack surface of your organization is significantly decreased allowing you to focus resources where they are needed most. Audit and compliance tools: The Access Manager includes its own unalterable audit trail to assist with regulatory compliance. While the Access Manager provides centralized access, the Session Manager provides real-time monitoring of your privileged users to prevent and detect suspicious activity. It records sessions in real time and uses optical character recognition (OCR) technology so your security team can search through metadata during investigations rather than spending hours watching footage. Monitor all privileged user actions in real time. This central PAM component manages and limits user access to pre-determined applications, programs, and critical information. Limiting employee access to only the tools they need to complete their job is a security best practice, and utilizing a Session Manager can significantly simplify enforcement of that practice. Real-time monitoring, alerting, and control systems: Security teams can monitor all privileged users’ actions in real time and get instantly alerted when suspicious activity occurs. If strange activity is occurring, then the Session Manager can even terminate the sessions automatically. Plus, for even more control, the Session Manager allows administrators to block specific actions for specific users. 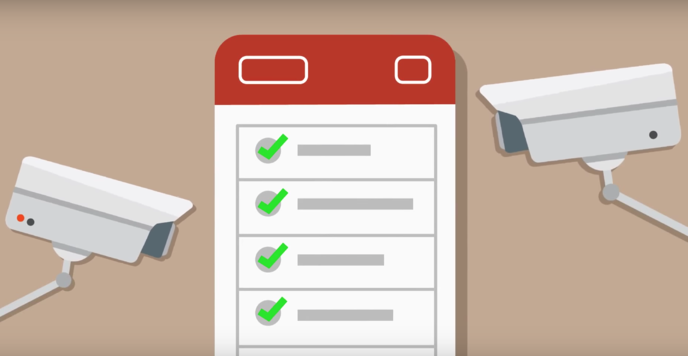 Compliance and auditing tools: Proving compliance can be challenging for organizations, but the Session Manager is able to make DVR-like recordings of all privileged user sessions that can be searched and reviewed using OCR technology, making every action completely searchable. Simple integration with other security solutions: The Session Manager integrates with your other security solutions allowing you to better leverage their capabilities and improve your entire security strategy. Simple deployment: You need a solution that is easy to use and implement. Without a simple interface, the solution won’t be used and the investment would have been a waste. Simplicity ensures that the solution is used and maintained in order to really protect your organization. Using a Password Manager helps security teams maintain control over passwords and strictly enforce password policies. Administrators can enforce the regular rotation and revocation of passwords while maintaining them all in a centralized and encrypted vault. The Password Manager helps security teams protect passwords and enforce strict password policies. 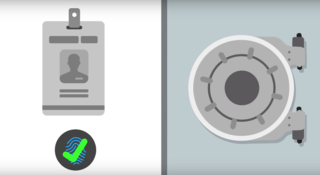 Encrypted vault: Passwords are maintained in a centralized vault and encrypted using SSH keys that utilize scalable architecture to integrate with other vaults and security solutions. Complete password management: Implement robust password policies including rotation and revocation throughout your entire organization using customizable workflows. Application-to-application password management (AAPM): Simplify AAPM by enabling application authentication with credentials. Using this methodology, hard-coded passwords and identification verification can be deleted from systems. Interoperability: Easily utilize the Password Manager features across all of your solutions, systems, and databases, with a huge plugin library. WALLIX provides a complete PAM solution through their Professional and Enterprise Bastion offerings. These Privileged Access Management features support organizations’ security efforts through comprehensive and robust security tools. 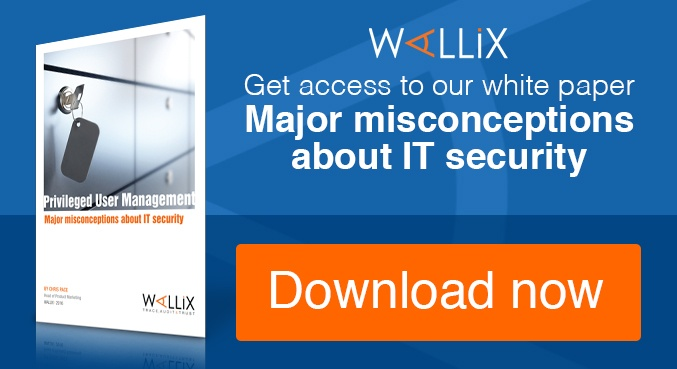 Easily monitor, control, and audit all the actions of your privileged users in order to detect and prevent breaches before they occur with the WALLIX Bastion. 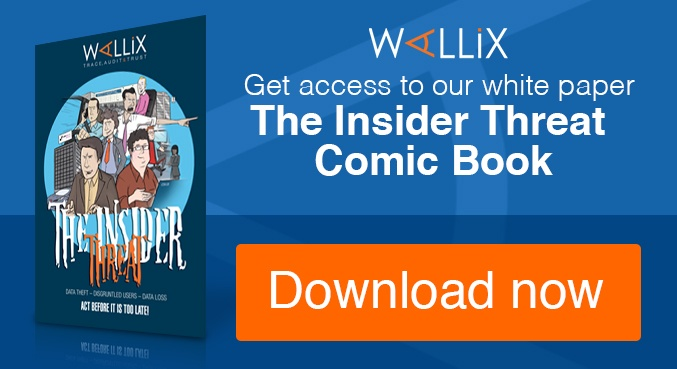 Want to learn more about the complete WALLIX solution? Contact us.